In January 1999 when St. John Paul II visited Mexico, he consecrated all of the Americas — from Canada to Tierra del Fuego — to Our Lady of Guadalupe, crowned her “the Empress of the Americas” and raised her feast day on Dec. 12 to a solemnity to be celebrated throughout all of the Americas. Historically, in 1531 Our Lady of Guadalupe appeared to Juan Diego, a humble, convert widower of Aztec descent of about 57years of age. The Virgin Mary appeared to Juan Diego requesting that a church be built at that site in her honor. After the apparition, Juan Diego related his story to the Spanish Archbishop of Mexico City, Fray Juan de Zumárraga, who did not believe that the Virgin Mary had appeared. The archbishop then instructed Juan Diego to return to Tepeyac Hill and ask for a miraculous sign to prove the woman’s identity. The next day, Our Lady of Guadalupe appeared again to Juan Diego and the first sign given was the healing of Juan Diego’s uncle, who was dying. Then, Our Lady of Guadalupe told Juan Diego to climb the Tepeyac Hill in the freezing cold and find Castilian roses, flowers only found in Spain, in full bloom. Removing his tilma, a poncho-like cape made of cactus fiber, Juan Diego cut the roses and carried them to the Virgin Mary. She instructed Juan Diego to take the flowers to the archbishop. When he arrived at the archbishop’s residence, Juan Diego told his story and opened his tilma letting the flowers fall out. However, it was not the beautiful Spanish roses that caused the archbishop and his advisors to fall to their knees, but the beautiful image of the Blessed Mother painted on the tilma precisely as Juan Diego had described her. Within six years of the apparition, 10 million Aztecs converted to Catholicism. A church was erected on the spot of the apparition. Today this holy spot houses the Basilica of Our Lady of Guadalupe, which is the most visited Marian shrine in the world. Next to the shrine is a monumental statue of St. John Paul II, who visited Mexico often and was where he made his first trip after being elected pope to give thanks to Mary for his papacy. In 1977 the tilma was examined and studied with infrared photography and digital enhancement techniques. The tilma shows no sketching or any sign of outline drawn to permit an artist to produce such a painting. The image is inexplicable in its longevity and method of production. The miracle is both the image and the actual tilma which is about 475 years old. Cactus fiber usually disintegrates within 20 years, but the cloak has survived centuries. As to the image of Our Lady, within her eyes one sees the reflection of a man kneeling and a woman, who is described like Our Lady of Guadalupe. Scientists and ophthalmologists cannot account for this occurrence. At St. Patrick Church in Norristown, this important day starts early in the morning at 3 a.m. with “las mañanitas,” which are traditional Mexican songs that are sung early in the morning on special occasions as with birthdays and especially on the Feast of Our Lady of Guadalupe. Hundreds of roses are presented to Our Lady of Guadalupe by the faithful for her intercession and favors bestowed during the year. Musicians, especially mariachis, and singers wake up Our Lady. The St. Patrick dance troupe, “Nuevo México, provides a history of pre-Hispanic Mexico and the actual apparition in dance form. When the early morning program ends at 7 a.m., breakfast is prepared for all from donations from local bakeries and stores providing coffee, hot chocolate and atole, a drink made with corn flour, cane sugar and cinnamon, and champurrado, which is a chocolate version of atole. St. Patrick Church is opened all day and then there is a procession held at 6 p.m. when people walk to the church following the statues of Our Lady of Guadalupe and Juan Diego, praying and singing, asking for favors or in gratitude for help offered by Jesus through Our Lady. A Mass is celebrated afterwards in a packed church. All types of faithful come to church that day — those who come daily to Mass, those who come Sundays, those who come only once or twice a year, members of “gangas,” children, infants, mothers, fathers, single people, married people. 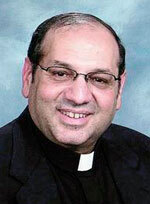 Father Augustus Puleo is pastor of St. Patrick Parish, Norristown. PREVIOUS: Mom and Dad’s Christmas: Humbug or happy?